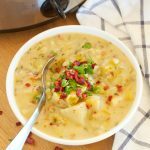 A deliciously easy potato soup made with bacon and leeks - slow cooked comfort food at its finest! Add the potatoes, leeks, bacon, onion, sea salt, thyme, parsley, pepper and chicken stock to your slow cooker. Stir well to combine, add the lid and turn the slow cooker to the 'high' setting. After 6 hours have passed, whisk together the milk and flour until well combined and no lumps remain. Turn the slow cooker to 'low' and add the milk and flour mixture to the slow cooker, stirring well to combine. Replace the lid and cook on low for another 30 minutes. Garnish with fresh parsley and crumbled bacon, if desired, and serve!